Inground pools require proper deck drainage in order to remain clean and prevent standing water. Proper drainage prevents excess debris from entering your pool and provides somewhere for splash and rain water to go. Whether you are having a new pool installed or a new deck placed around an existing pool, follow these proper deck draining guidelines to keep your patio in great condition. It may seem like the small amount of splashed-out water on a pool deck will just evaporate and dry. In some cases, it might. However, splashing is not the only source of water on a pool deck, and even splashing can overwhelm a poorly-designed patio. The main problems with poor deck drainage are puddling, outside water getting into the pool, and pool water overwhelming the natural drainage system. Puddling on the deck can cause ugly mold and stains, as well as being slippery. Outside water, such as water coming from a downspout or a raised planter box, tends to carry dirt, debris, and bacteria into the pool. In some cases, pool water drains off the patio into the landscaping. This may work fine when the weather is hot and dry and the soil is desiccated, but it’s not great when the weather is wetter and the soil is saturated. Not dealing with this excess water may drown plants, cause soil to be washed away, and allow dirty water to wash back into the pool. A pool deck should slope away from your pool in order to prevent dirty water from draining into it. This includes water that was splashed out of the pool and contaminated with dirt and debris. Ensuring that the deck slopes down and away from the edge of the pool prevents dirty water from draining into your nice clean pool. The slope of the deck should be approximately a quarter of an inch per foot. This means that a proper pool deck will have about an inch of fall for every four feet of width. Some decks have a single slope in one direction, while others have valleys or multiple slopes for drainage in different directions. Strip drains are long, narrow metal grates covering a trench-like structure that the water flows into and is then directed away from the patio. 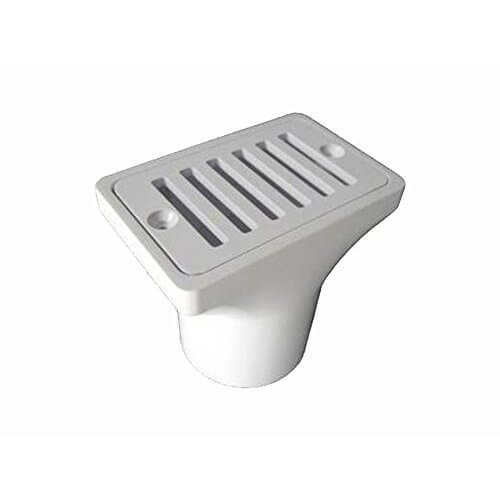 Strip drains are ideal for patios that run up against houses and patios with a valley in them to direct water to a center point instead of up against a house. Spot drains are best for free-form decks that may not have a lot of places to put a strip drain. They perform a similar function to strip drains, but they are round and multiple drains are connected to each other using piping. 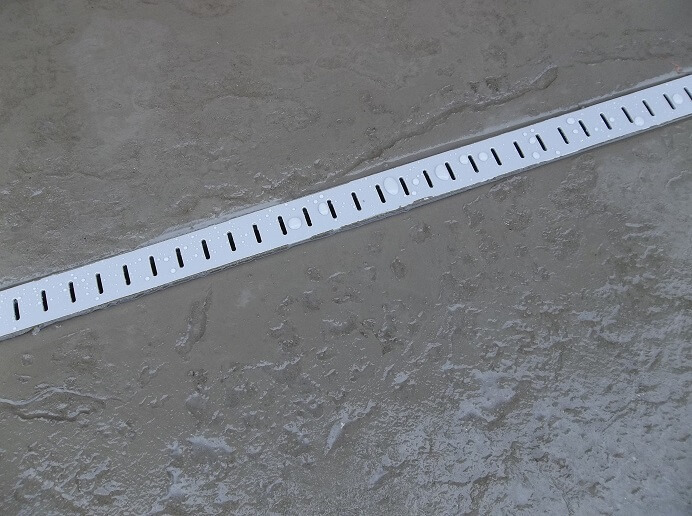 You can place a few spot drains throughout the pool deck where water will collect naturally. French drains are gravel-filled pits that have a drain pipe in the bottom. They are typically used when a pool deck ends in landscaping, but the volume of water running into the landscaping is too much for natural drainage. French drains fit in nicely to the natural landscaping around your pool deck. Deck drainage is an important part of owning an in-ground swimming pool. However, most people already have a drainage system, so the question becomes when should it be replaced or remodled? Some problems can be resolved without replacing the system, while others can only be remedied with a new set of equipment. The number one thing to look out for is lack of drainage. If there is standing water anywhere that it shouldn’t be, it is time to take some kind of action. Another problem might be that the water is draining, but not where you would like it to. Of course, if the drainage system that is in place is rusting, cracking, or otherwise breaking, it may need replacing. If you are having problems with overwatering in your nearby landscaping, you may want to investigate your pool drainage system and make sure that it is not dumping too much water into the softscape. In some cases, it is hard to determine whether the drainage system is the problem because spillover from the pool may be intermittent depending on use. In these cases, try to watch where the water drains when people are using the pool. The first thing to consider is whether the drainage system you have is malfunctioning or simply not adequate. A good drainage system using piping that is clogged up should be flushed, using a pump if necessary to create the needed water pressure. 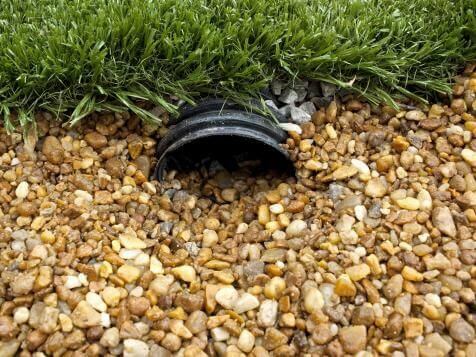 A drainage system that consists only of providing a way for water to run off into the landscaping may require the addition of more formal drainage equipment in order to deal with the water flow. In some cases, piped drainage systems may become clogged with something that cannot be washed out, such as concrete. If your drainage system is sluggish and cannot be flushed clean, consider this as a potential issue. Broken equipment can also cause drainage problems, so it may be necessary to inspect the entire system for issues if it cannot be properly flushed. If you have water going where you do not want it to, you might need to install additional drains in your system. Putting another drain between the source of the water and the location where it is currently ending up should solve this problem. However, if an existing piped drainage system is in place, this may require some construction work. At BlueTerra Pool Construction, we are experts in pool deck drainage requirements and always incorporate them into the work we do. Our decks are attractive, practical, and always built with attention to drainage details. Nobody wants ugly, slippery puddling or dirty pool water, and decks are expensive to replace, so you want to get them right the first time.